I love everything weird and colorful in this world and I try to live a life that will make the world a little better once I'm gone. Imagine being a child, and every night the bedtime routine is to just get in bed and fall asleep. Not to put on pajamas, not to read a bedtime story, but to just lift a blanket over the clothes they are wearing and sleep. Thousand of children, here in America, do not have pajamas or a comforting nighttime book. They are in shelters or group homes waiting for someone to adopt them. They are living in temporary housing after a natural disaster. Their parents are in jail. Or, they are homeless. Now imagine the opportunity to fix that for them. Imagine the chance to give a child a new pair of pajamas and a good book, to make the end of a long hard day a little softer. For a child with little, a soft pair of jammies can simply mean that someone cared. Genevieve Piturro founded the Pajama Program with her friend Alice Quirk and their friends and relatives. 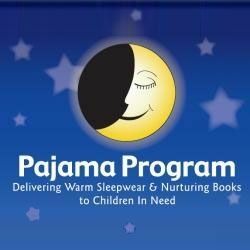 Starting in NYC, but now nationwide, The Pajama Program provides donated new warm pajamas and comforting books to children who desperately need them. The Program works with various agencies to prove the PJ's to children in need and children waiting to be placed in permanent homes. The Pajama Program has also extended its aid to needy children in Armenia, Bosnia, Brazil, Columbia, Greece, South Africa, Uganda, Kenya, and Ukraine. Donate online with a credit card at to help them purchase pajamas or donate by phone at 212-71MYPJS (212-716-9757). Hold a Pajama Program Fundraiser. Go for it! Step up and organize your own event. I know you can do it! Let the next gift you give be a gift card for a donation in their name. Rather than giving Aunt Ellen something she'll hate, give her a gift that will make her happy and make a child happy, too. 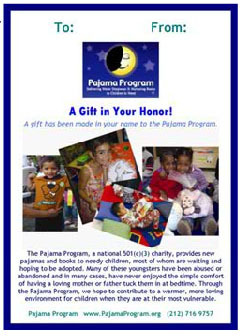 Contact a local chapter of Pajama Program to see how they can use your help. There may be a local project happening that just needs a little manpower or a few connections from great volunteers like you. 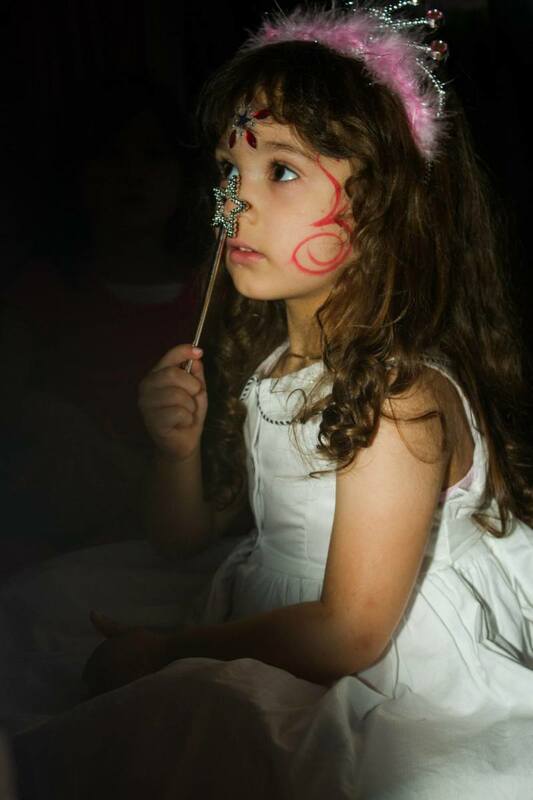 Use your website to direct attention (and traffic) to PajamaProgram.org. Write a blog or simply tell everyone that you support The Pajama Program. Follow The Pajama Program on Twitter (maybe even give them a retweet every now and again) or connect with The Pajama Program on Facebook. 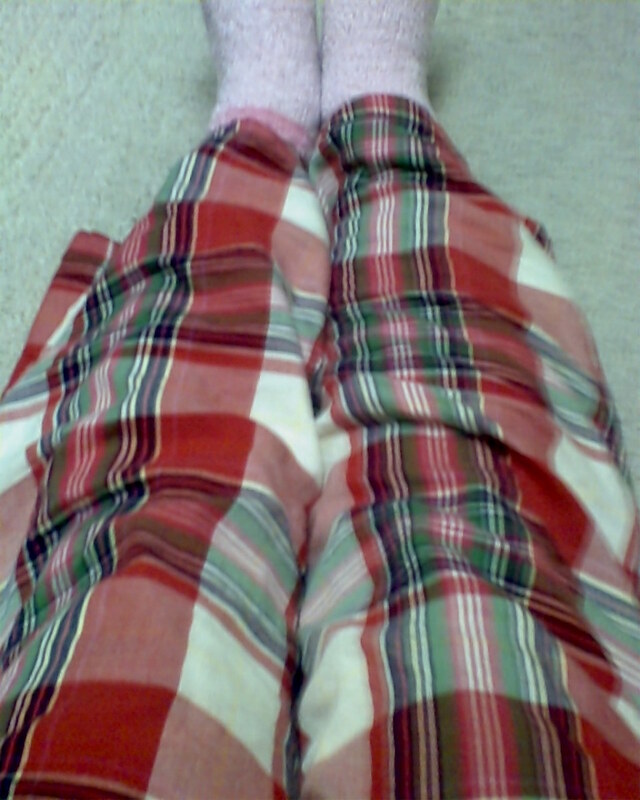 Pajamas represent comfort and relaxation. The warmth they provide extends to warmth of heart. The kids who benefit from the Pajama Program feel better after a day that may not have been so great, when they slip into a soft warm pair of pajamas that belong to them. 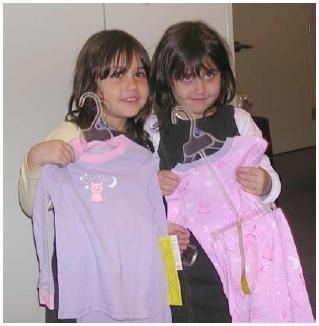 If you purchase pajamas on ebay to send to The Pajama Program, be sure they are New With Tags (NWT). Genevieve Piturro knows she wants to work with children, and something she saw while volunteering at a shelter reveals her calling. Did you realize that so many children didn't have even a pair of pajamas? I hadn't realized before I heard about the Pajama Program. I have known this for some time. 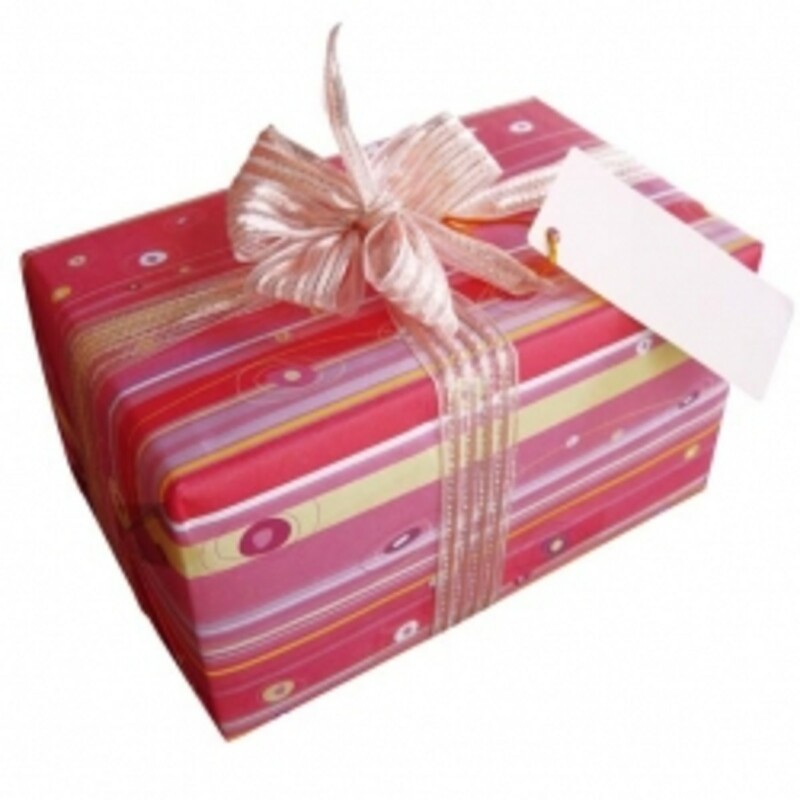 Give someone a gift that gives twice. Give them a gift card for The Pajama Program. Thousands of teenagers wait in foster care with very little attention. They have aged out of many charity programs geared for younger kids, and have a harder time finding someone to adopt them. Treat one of these older kids to something special. The Pajama Program meets the Better Business Bureau's 20 charity standards - the highest ranking for non-profits! People Wearing Pajamas in Public - Why? Thank you for writing this, and drawing attention to such a wonderful organization. I use my piano music to try to raise money and awareness for different organizations (I actually just finished a lense on about why I do this). This is exactly the type of organization I'm looking to help...I can't believe I never heard of them. I'm going to see if there is one that's local to me, and if they want my help. Thanks again! Well and then there are all the children in third-world countries who in addition to having no pajamas have no bed or blanket. We've worked in a few areas like this and still send things back to areas we've been. Thank you for making me and others aware of this charity. Thanks for the lens--well needed and GREAT information! Wonderful! Thanks for creating awareness. This is a wonderful charity for children. Blessed by the Charities Angel. I love this idea - thanks for this great lens! I had no idea that children in care were not even given pjs. As a mother, I find this pretty upsetting. This is one of my favorite causes. Thanks for bring people's attention to it. Wonderful charity! When I adopted my son, he had two outifits, no pajamas, and no toys or books. It breaks my heart to think of children with so little. This is an amazing movement. nice lens this is something unique for helping children. we are also doing these kind of work for charity and if you want to be a part of it you can just shop with us and we donate a portion of your purchase to your favorite cause.we have added many causes for donate you can choose your cause and shop with us.we donate a portion of your purchase to your favorite cause. What an inspiring lens! Thanks for bringing attention to these wonderful people. Have a great day. Wonderful cause indeed and well presented here. Excellent lens - great group! Back again ! I saw that you are now on Twitter and am following you. I will TWEET your lens ! What a great cause ! Great Ideal! Will eventually try this project in addition to my children's book project. Check out my lens at www.squidoo.com/dyharris (have books, will travel to... Jamaica). Wow, I think this is absoultely wonderful! 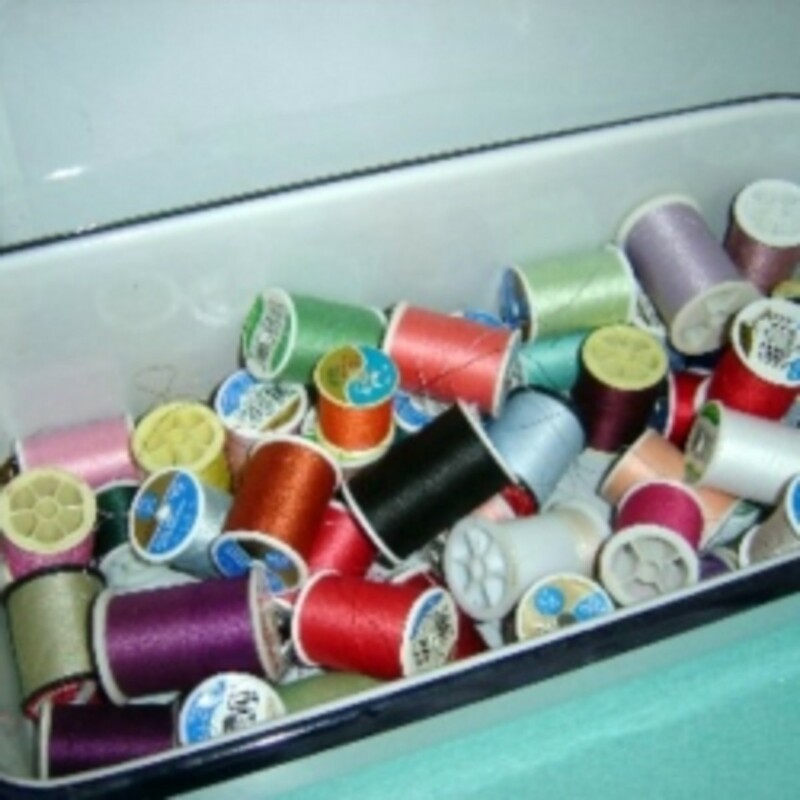 I had no idea such programs existed and I am going to forward this link to all my friends. What a great lens! Thank you for bringing this to my attention. This is a great program using a simple comfort of life, pajamas. An item that could easily be taken for granted by most. This makes me think of how much I enjoyed the comforts of bedtime as a child, and how my kids love their bedtime routine. This lens should make readers stop and smell the roses. Fantastic lens! 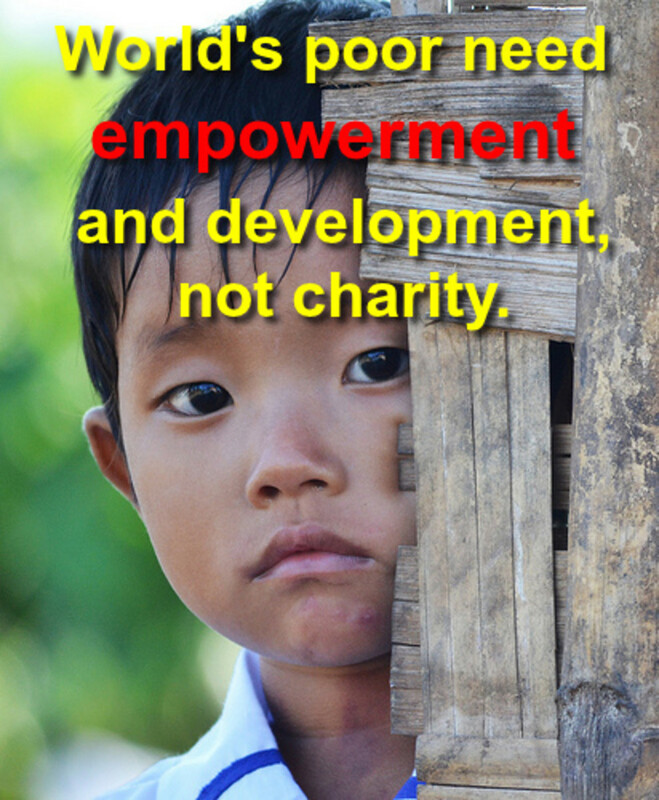 I'm going to add this charity to my lens right away. I appreciate you getting the word out in such an engaging way. Awesome lens! Thanks for helping to make so many people aware of this great program - I had no idea it existed. Every kid needs some nice jammies and a warm hug when they go to bed at night. What an excellent idea! Angel Blessings to you. Kab wonderful cause and lens great work virtual high five. Wonderful lens! Thank you for sharing a program that can mean so much to so many. A true eye opener! This is a cool program. I saw the Oprah show where she talked about this. Congratulations on your Giant Squid Awards nomination! WHAT A GREAT IDEA! I'M TOTALLY GONNA BLOG ABOUT THIS! AND, DONATE, OF COURSE! I am a foster mom (13 years now!) and the first thing I have to do with each new child placed in my home is to get some pajamas for him or her. They come into care with nothing ! It is very sad. I have learned to save outgrown PJ's (and various sizes of clothing) and keep them in storage because undoubtly the next child will need them too until we get to the store to buy new. Many placements are made in the evening after a long day in the Social Services office and the kids are very tired. The children seem to feel some sense of relief after a warm bath and fresh warm pajamas and a clean fresh bed - probably for the first time in a long time. So I encourage everyone who reads this lens to realize the great need there is for those PJ's that we all take for granted ! This is a cause and thank you for highlighting it with this lens. Congrats on your 2008 Giant Squid nomination...woot! (http://www.squidoo.com/2008-giant-squid-awards) Beautiful lens! Congratulations on your 2008 Giant Squid Awards nomination and good luck! - Kathy aka "Pretty Bullet"
Wonderful program! I am lensrolling it to my How You Can Make A Difference...lens. 10 years ago from Lake Country, B.C. I did a Digg for this worthy cause. Hope it helps. Having worked in schools around the province of BC I have met many such children and have done what I could do to help the families. I am so moved about this Program. I am from kentucky but now live in Minnesota and will be planning "pajama drives" in both states in near future! Thank you for informing me of this need. Thanks for making me aware of this program. PJs are pretty basic, not something any kids should do without! Never heard of this program. I think it is wonderful! I will definitely take time out to make a donation. On behalf of those you help and inspire, Thank you! What a wonderful program that you have. I love this! I am part of a website that networks with women to do positive things and I am going to mention your program in one of my blogs, so that others will know about what you are doing. So, creative and such a watm and cuddly thing to do for children. Wow. I had no idea this program existed. It always breaks my heart to think about kids with no books as books in the home is such a strong predictor for success in life. Thanks for doing this lens! I love "different" charities like this one.